This book represents the third of three volumes offering a complete reinterpretation and restructuring of Keynesian macroeconomics and a detailed investigation of the disequilibrium adjustment processes characterizing the financial, the goods and the labour markets and their interaction. This book offers a full treatment of the interlinkages between the real and the financial markets, including an analysis of banking, credit, and endogenous money and asset markets. It remains critical of quite frequently used conventional macro models that have dropped the tradition of studying the macroeconomic feedback channels, well-known in the history of macroeconomics. Those feedback mechanisms are known to have the potential for instabilities with respect to real markets, price dynamics and financial markets. In this volume a particular emphasis is given to the financial-real interaction. 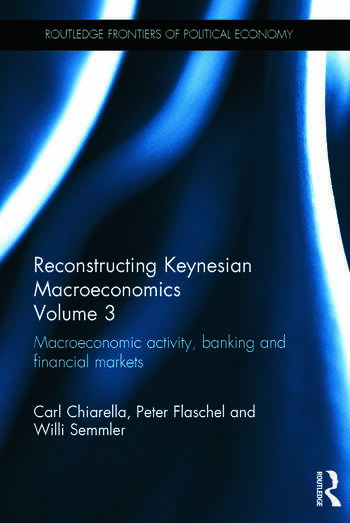 The research in this book with its focus on Keynesian propagation mechanisms provides a unique alternative to the black-box shock-absorber approaches that dominate modern macroeconomics. The main conclusion of the work is that policy makers need to reconsider Keynesian ideas, but in the modern form in which they are expressed in this volume. Reconstructing Keynesian Macroeconomics will be of interest to students and researchers who want to look at alternatives to the mainstream macrodynamics that emerged from the Monetarist critique of Keynesianism. This book will also engage central bankers and macroeconomic policy makers. Carl Chiarella is Professor at the School of Finance and Economics, University of Technology Sydney, Sydney, Australia. Peter Flaschel is Professor at the Department of Business Administration and Economics, Bielefeld University, Germany. Willi Semmler is the Henry Arnhold Professor of Economics at the Department of Economics, New School for Social Research, New York, USA.